Author: Sophie Murray, Space Weather Research Scientist at the Met Office. “Space weather” describes changing environmental conditions in near-Earth space. Magnetic fields, radiation, particles and matter which have been ejected from the Sun can interact with the Earth’s upper atmosphere and surrounding magnetic field to produce a variety of effects. Low level space weather events occur on a regular basis and whilst they can be of concern for specific industries, in the majority of instances they have little impact on our daily lives. Severe space weather events are very rare, however when they do occur the impacts to UK infrastructure can be significant. Major impacts include possible interruptions to radio communications and GPS, disruption of power grids, and damage to spacecraft (see Figure 1). Find out more information at the Met Office space weather webpages. As a result the UK Government listed severe space weather as one of the highest priority natural hazards in the UK National Risk Register of Civil Emergencies in 2011. With decades experience in operational weather forecasting underpinned by research, the Met Office was deemed owner of this risk. In response to the risk being added to the register, the Met Office Space Weather Operations Centre (MOSWOC; see Figure 2) was created. MOSWOC provides a 24/7 manned operational space weather service to help protect the UK from the serious threats posed by space weather events. MOSWOC forecasters provide space weather alerts, warnings, and guidance documents related to current solar and geomagnetic activity. This service provides timely advice of the impacts of space weather on UK services and infrastructure to Government and responder communities. Regular alerts and guidance are also provided to the general public at the Met Office space weather forecasting webpage. The Met Office is currently developing forecasting infrastructure to minimise the impacts of severe space weather. Alongside operational activities, ongoing scientific research is essential to understand the fundamental physical processes involved in driving space weather. The Met Office Space Weather Research group has been set up to supplement the work undertaken by MOSWOC. The research team investigates scientific methods that could be used to improve the models currently used by the forecasters. This basic science research is then transitioned to operations. 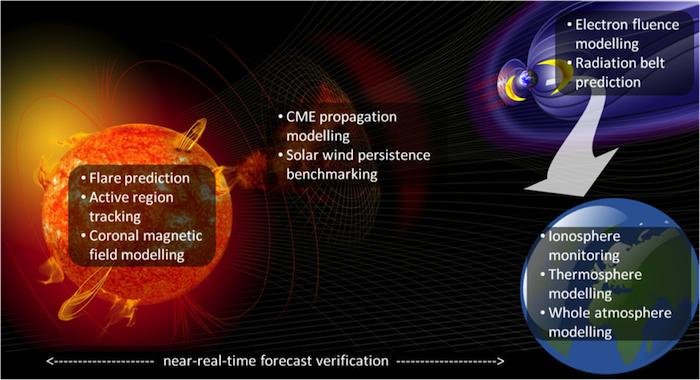 Figure 3 highlights just some of the main areas of current research, including solar, heliospheric, and Earth atmospheric physics. In the area of solar physics, the group is particularly interested in improving our understanding of the processes involved leading up to and during solar flares and coronal mass ejections. For example, research is currently underway to improve the WSA-ENLIL model (used by the forecasters for CME arrival prediction) using ensemble methods, as well as more accurate coronal magnetic field extrapolations developed by Durham University and University of St Andrews. Validation techniques are also being developed for the various models based on the extensive experience the Met Office has with numerical weather prediction verification. Future work by the group aims to couple the various prediction models together into a Sun-to-Earth model system with data assimilation for much-enhanced forecasting capability. The Met Office has been working in collaboration with National Oceanic and Atmospheric Administration (NOAA) since 2011 to build knowledge and capability to forecast space weather in the UK. The formal collaboration agreement with NOAA is in place to strengthen collaborative efforts to protect critical infrastructure from the impacts of space weather. 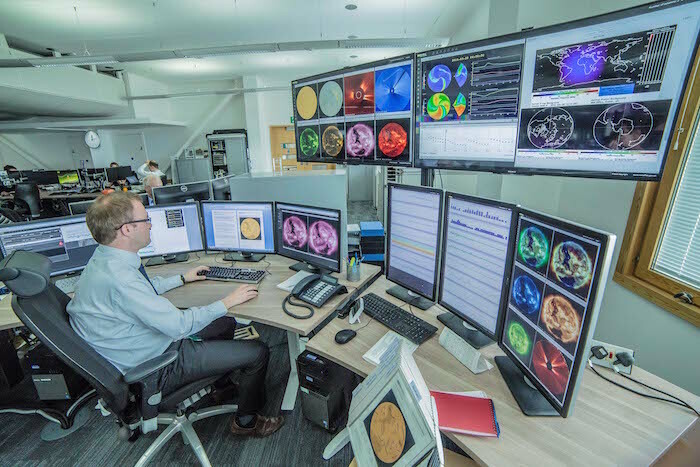 MOSWOC forecasters liaise on a daily basis with forecasters at operational partners NOAA’s Space Weather Prediction Center and British Geological Survey. MOSWOC is also a designated Regional Warning Centre and member of the International Space Environment Services, an international body for space weather. Working with international partners ensures a globally consistent message regarding current space weather conditions. The Met Office is working closely with a range of UK partners including British Antarctic Survey, British Geological Survey, RAL Space, University of Bath, UCL Mullard Space Science Laboratory, Imperial College, and several other universities and research organisations to transfer data, knowledge and models into the Met Office to support our operational space weather forecasting. Research collaborations extend further than the UK; the research group is currently involved in a number of EU programmes, namely FLARECAST, MISW, and ESPAS, and recently ATMOP and COMESEP. The space weather research team welcomes collaboration opportunities with the solar physics community to improve our current space weather prediction methods.